The simple fun of living in New Zealand is exemplified by the Kiwi's love for grilled food served amongst friends in a relaxing weekend. 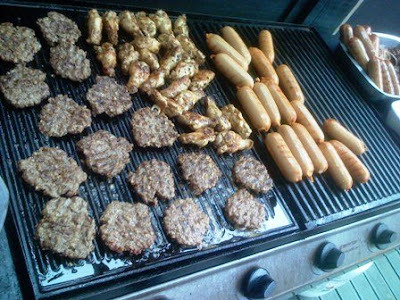 The barbecue grill - or more commonly called here as the barbie - is a staple cookware in a Kiwi home, with many models available especially during summer. Such simple joys is very adaptable to the Filipino lifestyle, as we also enjoy the company of friends and share even the most meger of meals. This weekend we were invited over at Glen and Cory's home for dinner with friends. I helped out with the grill and I immensely enjoyed savouring the smell of cooking food and easy conversation. 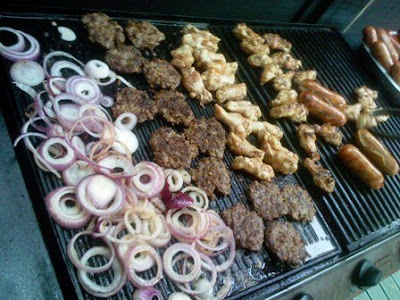 We had sausages, chicken tenders, and patties on the grill, with sweet onion rings. This feast was accompanied by a unique coleslaw recipe with nuts and dry noodles, fruits, homemade pizza, and of course, rice. I was stuffed full! Thanks Glen and Cory for another wonderful weekend!